Lockhart Elementary School Principal Felicia Adams got a big surprise at a school assembly on Friday – she’s been named a finalist for H-E-B’s Excellence in Education Awards. H-E-B officials suddenly appeared during the assembly, carrying balloons, flowers, cake and giant check. Adams was awarded $1,000, and the school will receive $2,500. This entry was posted in Achievement/Recognition, Elementary Schools and tagged Lockhart ES on April 4, 2014 by HISD Communications. 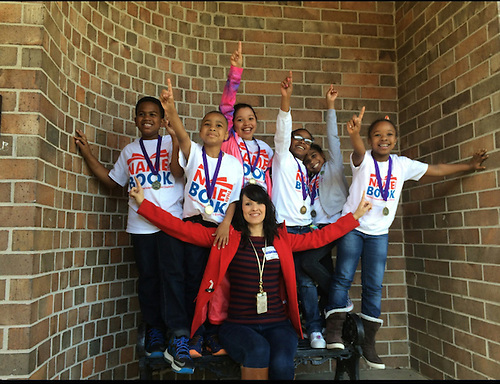 Six second-graders from Lockhart Elementary School brought home the gold in the HISD K-2 “Name That Book” contest in their second year of competition. Students received medals and certificates for their win. The annual K-2 competition prepares younger students for upper-level competition, which includes all grade levels and continues through April 17. Each school can enter only one team. “Name That Book” is an HISD reading incentive program that encourages teamwork and ongoing reading, which is critically important in meeting HISD literacy goals. “Literacy is a cornerstone issue for HISD,” said district Superintendent Terry Grier in his 2014 State of the Schools address. More specifically, that means that getting every HISD student to read on grade level by third grade is a major priority for the district. This entry was posted in Achievement/Recognition, Elementary Schools and tagged Almeda ES, Horn ES, Kolter ES, Lockhart ES, Longfellow ES, Mitchell ES, River Oaks ES, The Rice School, twain es, Williams ES on March 12, 2014 by HISD Communications.